This year's IPO calendar has been virtually empty so far, but that's about to change as three companies hit the market this week. 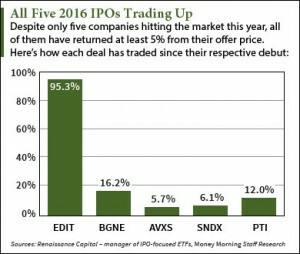 Renaissance Capital, a manager of IPO-focused ETFs, reports that only five companies have gone public in 2016. That's down a whopping 81% from 27 deals by this date last year. Despite low pricing activity, all five companies to go public this year have gained an average of 27.1%. That performance far outpaces the Dow Jones Industrial Average, which has fallen 1.3% in 2016. And according to Money Morning Executive Editor Bill Patalon – our senior research analyst with more than 22 years of experience as a financial journalist – these big returns indicate the IPO market will make a triumphant comeback in the coming months. "Because strong IPO returns often follow periods of 'low issuance' – Wall Street code for a shuttered IPO market – we could soon see a big upsurge in IPO deals and big rallies in the prices of recently issued shares," Patalon told Private Briefing readers last week. IPO Calendar Deal No. 1: Hutchison China MediTech Ltd. (Nasdaq: HCM) is a Chinese developer of oncology and cancer treatments. The biotech's majority owner is CK Hutchison Holdings, a Hong Kong-based international conglomerate with businesses in more than 50 nations and annual sales of over $50 billion. Founded in 2000, Hutchison China MediTech posted $178 million in sales in 2015. The company currently trades on the London Stock Exchange and is up over 81% in the last year. It plans to raise $100 million, making it the second-largest IPO of the year behind Beigene Ltd. (Nasdaq ADR: BGNE), which raised $158 million last month. Hutchison China MediTech will sell 6.1 million American Depositary Shares (ADSs) – shares of a foreign-based company available for purchase on a U.S. stock exchange – for $16 each. The firm is valued at nearly $2 billion and will hit the market on Thursday, March 17. IPO Calendar Deal No. 2: Senseonics Holdings Inc. (NYSEMKT: SENS) is a Maryland-based company that sells an implantable glucose monitor for diabetics. The device is called Eversense and transmits real-time glucose levels to users via the company's mobile app. On Jan. 21, Senseonics announced it launched the Eversense's Precise II trial, which will determine the device's overall survival duration and safety. The company plans to generate $60 million by offering 18.2 million shares at a price range of $3.10 to $3.50. It commands a $341 million valuation and will start trading on Wednesday, March 16. IPO Calendar Deal No. 3: Spring Bank Pharmaceuticals Inc. (Nasdaq: SBPH) is an early-stage biotech working on therapies for a number of viruses, including hepatitis B and respiratory syncytial virus (RSV). The company's treatments use a nucleic compound called SMNH, which targets specific proteins implicated in various diseases. Two of its leading treatments for hepatitis B and RSV are set to enter phase 2 trials sometime this year. Spring Bank will raise $40 million by selling 2.86 million shares for $13 to $15 each. The company is valued at $132 million and will debut on Friday, March 18. Alex McGuire is an associate editor for Money Morning who writes about upcoming IPOs. Follow him on Twitter for the biggest IPO calendar updates.